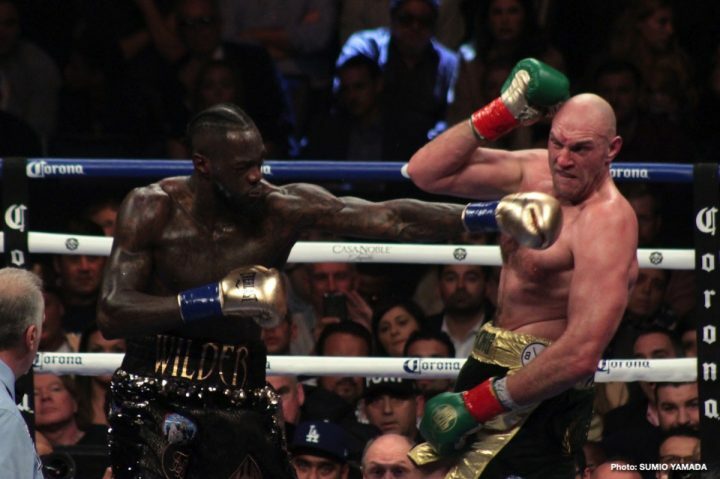 By Scott Gilfoid: Tyson Fury (27-0-1, 19 KOs) believes that he’s going to improve dramatically for his rematch against WBC heavyweight champion Deontay ‘Bronze Bomber’ Wilder (40-0-1, 39 KOs). Wilder and Fury are expected to face each other in a rematch on May 18 to settle the controversy surrounding their previous fight on December 1 at the Staples Center in Los Angeles, California. Fury came into the fight with Wilder weighing 256 lbs, and looking flabby around the sides. This was only 2 lbs lighter than the 258 lbs Fury weighed for his previous fight 4 months earlier against Francesco Pianeta last August. There wasn’t much of any improvement from the conditioning of that Fury than the one that faced Wilder. What this means is that Fury might be getting diminishing returns from his and weight loss program. “I fight May 18 and win, then I go straight to the f****** pub for a two-month bender,” Fury said at a speaking event in Cardiff last Friday. You hate to say it, but Fury’s 12 round draw against Wilder last December might be as good as it gets for him If Fury can’t burn off 13 to 15 lbs of fat to get down to the 243 lbs he weighed for his win over Wladimir Klitschko in 2015, he’s likely going to be too slow to beat Wilder. That’s hilarious how Fury compared himself to Roy Jones Jr. Yeah, Fury is like the 49-year-old version of Jones, but definitely not the prime version. Gilfoid must admit, the way that Fury was knocked down twice by Wilder in the championship rounds was very Jones-esque. Those were classic Jones type knockdowns. The Wilder vs. Fury fight was scored 115-111 for Wilder, 114-112 for Fury and 113-113 even. The judge that scored it even is Phil Edwards from the UK. He didn’t believe Fury deserved the win. Well, Fury is probably right about him never fighting Joshua. I mean, that seems to be a given that those two aren’t ever going to fight each other unless Fury is willing to take the smaller end of the financial pie. As long as Fury let’s Joshua hog the purse, they’ll end up fighting each other. But if Fury is looking for parity in splitting of the plunder, he can probably forget about, which is good for Joshua. He seems to have some kind of long term milking plan for his heavyweight titles. As long as Fury and Deontay don’t get in the way, Joshua can milk his titles for the next decade, while his promoter Eddie Hearn brags about how he’s the best heavyweight on the planet.